The LUH series has been discontinued. Please contact our Temperature Engineering department for a viable replacement. MOUNTING LIMITATION Hazardous atmosphere—Unit heaters should not be used in potentially explosive atmospheres. Corrosive atmosphere—The finish is not intended for direct salt spray exposure in marine applications or the highly corrosive atmospheres of greenhouses, swimming pools, chemical storage bins, etc. 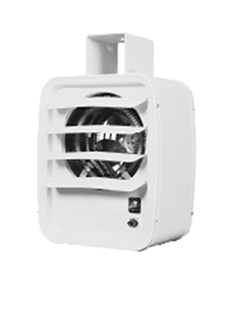 Mounting height— Do not install unit heaters above recommended maximum mounting height. Obstructions— must not block unit heater air inlet or discharge.